One climbed Mount Kilimanjaro. Another started college in third grade. Another opened a business at age 9. And yet another scored 5580 on the SATs (on a total of 5 tests, but still). Now they’re all getting two years of mentoring from a network of tech and entrepreneurial experts and $100,000 to start a business. The benefactor? 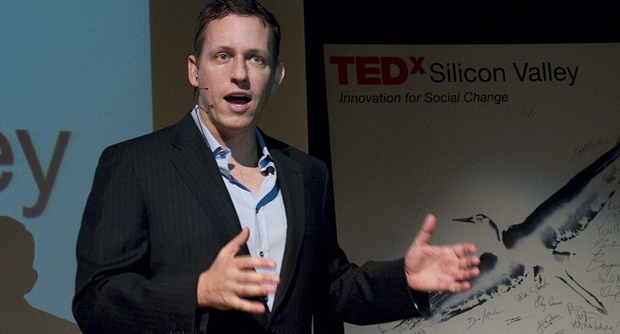 PayPal founder, early Facebook investor, and Stanford’s least favorite alumnus, Peter Thiel. Least favorite because Thiel has been making waves by arguing that college is an overhyped, overpriced bubble, and that the world needs better ways to recognize young talent. It’s all been great fodder for debate, but little more. Until today. Thiel just put a bit of his money where his active mouth is. He’s requiring his “20 under 20” entrepreneurs (24 including some teams) to stop out of college while they pursue their dreams. Fittingly, a fourth of the proposals are in the fields of education or career development, while the others encompass a range of trendy fields. “David (Jiageng) Luan plans to do for consumer robotics what the IBM PC did for computing,” Thiel says in a statement. “Eden [Full’s] SunSaluter is a solar panel tracking system that optimizes energy collection by up to 40% for only $10.” John Burnham, bless his soul, wants to “solve the problem” of space mining. Will any of the wunderkinder turn their ideas into thriving businesses or world-changing technologies? Perhaps. Will they gain a huge amount from the experience? No doubt. Will they change our perception of the importance of a college degree for success? I’ll be watching in the weeks and months ahead to find out. Laura Deming wants to extend the human lifespan for a few more centuries—at the very least. She started working in a biogerontology lab when she was 12, matriculated at MIT when she was 14, and now at 17 plans on disrupting the current research paradigm by changing the incentives embedded in today’s traditional funding structures. Too often, researchers design quick incremental projects to please grant-making bodies instead of taking on risky, long time horizon problems. With her fund IP Immortal, Laura plans on commercializing anti-aging research, bringing therapies out of the lab and into the market sooner. Alexander Kiselev is a 19-year-old immigrant from Moscow who is worried that scientific advances in the biosciences aren’t developing fast enough. To spark a new age of discovery, he wants to make experimentation cheaper by creating affordable scientific instruments. With help from the open source hardware community, his first project will be an inexpensive high performance liquid chromatography system, a tool that helps biochemists analyze the components of a sample. Darren Zhu has conducted research in a wide range of cutting-edge areas, from molecular spintronics fabrication to therapeutic drug design. He is most excited about synthetic biology, a burgeoning field that engineers solutions to biological problems by using standardized genomic components. After he stops out of Yale, his first project will be to build a diagnostic biosensor, the initial step toward his goal of making synthetic biology easier to engineer. Daniel Friedman, Paul Gu, and Eric McKay are passionate about equipping people with the information to make better decisions. In some markets, high noise-to-signal ratios make it hard for the best to distinguish themselves from the lemons. With a wealth of talent in mathematics, programming, and social entrepreneurship, this trio plans to create a more efficient recruiting process driven by a peer-based evaluation system. Dale Stephens was homeschooled and then unschooled. Now he wants to build a platform called RadMatter to revolutionize how we develop and demonstrate talent in the twenty-first century. At 19, he is a non-conformist in most aspects of his life. Jeffrey Lim wants to increase the amount of voluntary exchange and cooperation in the world by revamping some of our core economic and social institutions. He believes it’s time the means of exchange caught up with the Information Age. Once he stops out of MIT, Jeffrey plans on using his fellowship to create technologies that will help people self-organize to solve social problems. He’s particularly interested in helping people protect the wealth they create from the harmful effects of inflation. Faheem Zaman has shot the moon on nearly every SAT test he’s ever taken: 5580 points across 5 tests. He wants to decentralize banking in the developing world with a mobile payment system. Because savings are difficult in poor countries—including in some regions of South Asia where many have to hoard and protect cash—Faheem believes mobile financial services will help bring prosperity to these areas. Before he introduces his technology to the developing world, Faheem’s initial plan is to gain a foothold in the U.S. market for mobile financial services. Nick Cammarata and David Merfield are working on OPEN, a project that aims to flip the industrial-scale classroom experience. Instead of wasting time lecturing (content OPEN’s online videos are better at providing), teachers using the platform will get to use class time for more one-to-one tutoring with students on the hard problems. With a decade of programming experience, Nick has worked for Microsoft, Stanford, and Mozilla and is an active contributor to several open-source projects. David has designed web interfaces used by millions of people around the world. He has lived and been educated in England, Singapore, France, and the USA. Andrew Hsu started doing research in a pathology lab when he was 10. By the time he was 12, he had matriculated at the University of Washington. Soon after, he graduated with honors degrees in neurobiology, biochemistry, and chemistry. He was a 19-year-old 4th-year neuroscience Ph.D. candidate at Stanford University when he left early this year to pursue his start-up, Airy Labs. John Marbach has years of experience working as an Internet marketer in customer development—he founded a vacation rental portal as a high school freshman—and he blogs frequently about emerging technologies. Now, with his start-up Ingenic, he wants to leverage web-based videos and mobile apps to bring the classroom into the twenty-first century. Tom Currier developed a deep obsession for entrepreneurship, cost reductions, and renewable energy after starting his first business when nine years old. To achieve grid parity, Currier believes that the solar industry needs a fundamental balance of systems breakthrough. He co- founded Black Swan Solar two years ago to commercialize an invention that enables dual-axis photovoltaic module tracking. Jim Danielson is working on building a more powerful and efficient motor for electric vehicles. He has already electrified a Porsche 924S, including power electronics of his own design. He is currently co-launching Makt Systems LLC, a start-up to commercialize his research and design. Before becoming a Fellow, Jim co-founded the Electric Vehicle Club at Purdue and was president of Purdue Innovations, the university’s entrepreneurship club. Eden Full is the 19-year-old Canadian founder of Roseicollis Technologies, a solar energy start- up that deploys her patent-pending inventions in established and emerging markets. Currently electrifying two villages of 1000 citizens in Kenya, Eden’s SunSaluter is a solar panel tracking system that optimizes energy collection by up to 40 percent for only $10. She began developing her social enterprise when she was 15. Sujay Tyle is one of the youngest students at Harvard and is passionate about hacking cellulose to create cheap biofuels. He first worked in a lab when he was 11, interned at Dupont as a teenager, and won the grand prize at the 2009 International Sustainable World Energy Olympiad in Houston. With his older brother, Sheel, he also runs ReSight, Inc., a 501(c)(3) non- profit dedicated to helping the vision-impaired around the world. James Proud taught himself programming at the age of 9. In his teens, he built products for companies such as Coca-Cola and Universal Music, while juggling his studies during the day. Upon graduating from the British equivalent of high school, James decided not to enroll in university and instead founded GigLocater.com, a start-up that aims to help music lovers discover more live shows. Christopher Rueth thinks access to the entire Internet is a basic human right. When he was in high school, administrators put in place draconian Internet restrictions and also started logging all student emails. Upset by the school’s intrusion, Chris created a website that allowed students in his district to bypass this snooping. Now Chris wants to help emancipate information around the world. Ben Yu had just returned from climbing Mount Kilimanjaro when he interviewed with the Thiel Foundation. He was about to climb another mountain in China when he learned he had won. His next challenge is to build an e-commerce start-up that will revolutionize price comparison on the web. Before climbing Kilimanjaro and taking on the current leaders in comparison shopping, Ben was a freshman at Harvard. Sebastien Zany is pursuing a program to unify computation in a cohesive and elegant framework based around Haskell, with the goal of finally realizing the potential of computers and the Internet to enable people to work with information fluidly and creatively, especially on mobile devices. Gary Kurek has been developing mobility aids for physically-disabled citizens for the last four years. Seeing his grandmother weakened by cancer led Gary to invent a walker-wheelchair hybrid that can provide power to assist its user according to how strong she feels at any moment. This flexibility allows users to restore their strength, instead of growing dependent on a substitute. Gary is currently working on expanding the versatility of his mobility aids, making them lighter, foldable, and capable of navigating any home environment including staircases. Gary hails from Alberta, Canada, and is the 19-year-old founder of GET Mobility Solutions. David (Jiageng) Luan plans to do for consumer robotics what the IBM PC did for computing. He came to America when he was 6 years old, began taking college courses at Worcester State in Massachusetts in 3rd grade, and received a certificate in computer science by the time he was 12. As student at Andover and Yale, he has been involved in robotics research for five years and now wants to create home robots that can handle an extensible array of low- to mid-level cognitive tasks in addition to physical jobs. John Burnham believes that the search for new resources has driven exploration, expansion, and innovation—from the discovery of the Americas to the California Gold Rush. Likewise, he believes the key to colonizing space is to make it possible to extract valuable minerals from asteroids, comets, and other planetary bodies. John plans on using his fellowship to develop space industry technologies to solve the problem of extraterrestrial resource extraction.